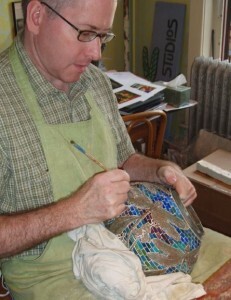 Bill has been busy working on the glass mosaic on a Dragonfly Mosaic Urn base. 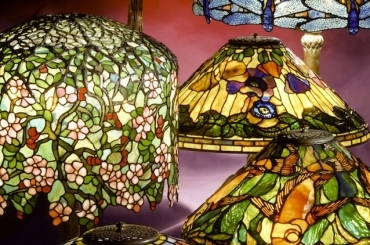 Time consuming and frustrating, the tiny shards of glass must be expertly fit into the cast bronze lamp base that features flying dragonflys and flowering water plants in relief. Small strips of glass are cut, then segmented into the tiny rectangles that will make up the larger sections of mosaic in the base. 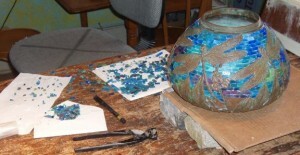 These pieces are then individually cemented in place one at a time until the entire surface is covered with glass. Every piece that comes up to the edge of the bronze dragonflys and leaves has to be painstakingly fit to the contours of the metalwork. 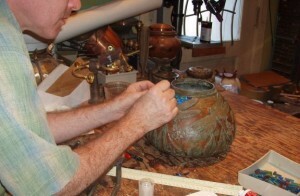 Often, the pieces are carefully lifted into place with a tweezers, especially difficult since the glass wants to jump from the delicate pincers and fall off the work surface. 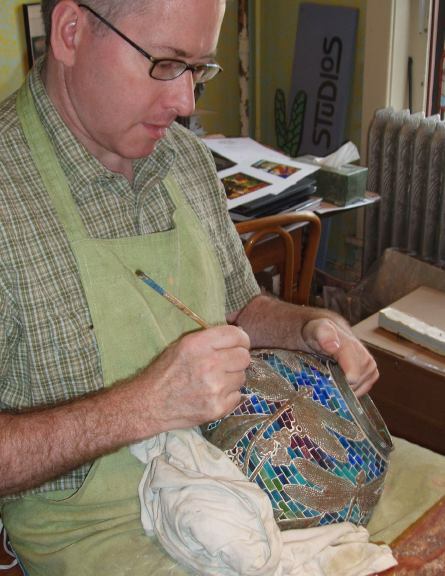 Once the surface of the base is covered in glass mosaic, it is grouted by hand, excess grout is cleaned off and the base is completed. 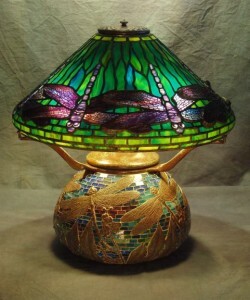 The finished lamp (shade and base) are now in the collection of a Chicago area client.